(815) 544-5434 or click here to email with any questions. Please click here to view the Adolescent Outreach brochure. If you are pregnant or a parenting teen, 19 or younger (that includes teen dads, by the way! ), and you live in Boone County, the Catholic Chartities Adolescent Outreach Program is here to serve you. 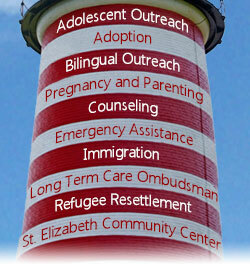 The Adolescent Outreach Programs works for you, with you...it's about you! We will meet you at your home, school, even the park, if that is where you are most comfortable. We respect your privacy too. Everything between you and your outreach worker confidential. You will find resources to help you manage your new life and help you connect with services and assistance in your community. Creating and living with daily schedules and routines that will work for you.